The Trading category sets all trading properties and allows configuration of simulation accounts. Sets if NinjaTrader will open a popup to confirm each order placed preventing an accidental order submission. Sets if NinjaTrader will start with Global Simulation Mode enabled preventing live orders from being submitted until you manually disable Global Simulation Mode. If checked NinjaTrader will allow you to submit orders using the order-entry Hot Keys, which can be defined in the Hot Keys window. See the "Hot Keys" section for more information. Sets if the position average entry price will be based on the FIFO (First in First Out) method or LIFO (Last in First Out) method. This only affects accounts that NinjaTrader calculates the unrealized PnL for. If your broker provides the unrealized PnL, you would need to see if your broker can adjust this on their end. Sets if the last trade price is used to calculate profit and loss, or if the Bid will be used for long positions and the Ask for short positions. Sets if orders on simulation accounts will be filled immediately instead of using the NinjaTrader advanced simulation fill engine. Sets if partial fills will be forced on simulation orders. When disabled, orders are filled based on the NinjaTrader advanced simulation fill engine. 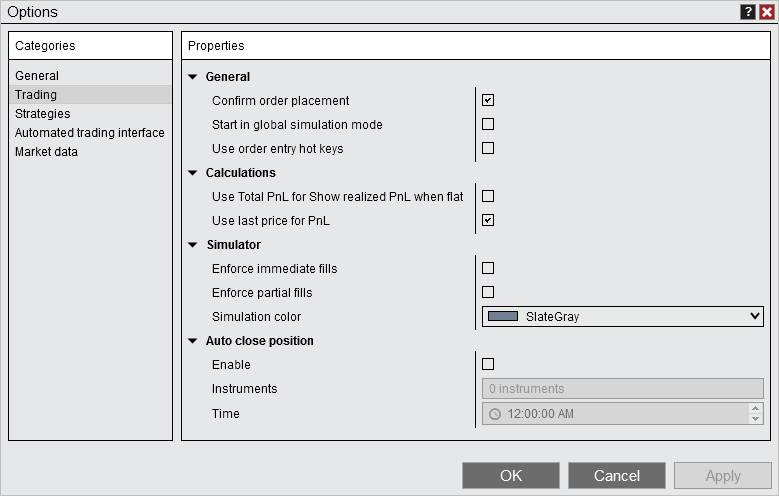 Sets the background color of any order interface that has a simulation account selected. This feature is disabled if set to "Transparent". Sets if NinjaTrader will close out any positions automatically at the specified time. For see more information, see the "Understanding the auto close position function" section below. Sets the instruments for which NinjaTrader will attempt to close positions at the specified time. This is set for each individual order-entry window, and can be set here by selecting the Instruments field and clicking add in the window that appears. Sets the time at which NinjaTrader will attempt to automatically close positions held in the instruments set in the instruments field. Note: The time will be based upon the timezone set up in the General section of the Options window. NinjaTrader can be set to automatically attempt to close a position at a designated time that is configured in the Tools > Options > Trading menu, you can also add instruments through the NinjaTrader trading interfaces via right click and selecting Auto close position. Sets if NinjaTrader will close out any positions automatically at the specified time. Note: This feature is not available to Direct Edition license users. Please contact [email protected] for upgrade options.